These easy lemon bars can be made in one bowl and come together super fast. 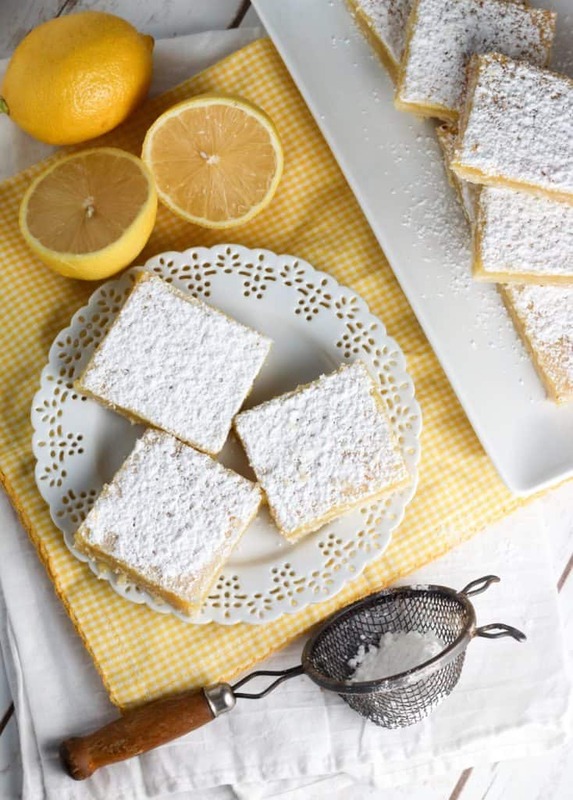 When citrus is in season, grab some lemons and make these easy lemon squares now! Now they say your tastebuds change as you get older. That can only explain why I now crave lemon desserts. Because as a child if it was dipped, dunked, covered, drowning in chocolate I wanted it. But lemon? Nah, pass. Now that I’m older? 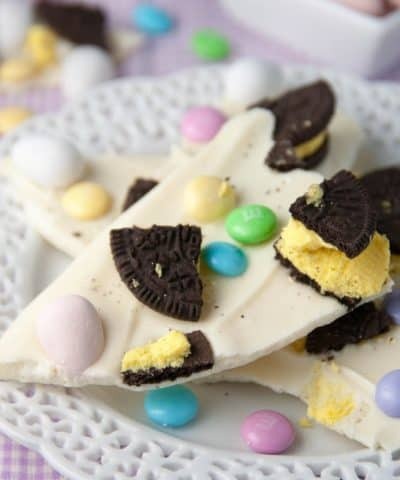 Ok, now I still want it if it’s dipped, dunked, covered, drowning in chocolate. But for whatever reason, I also can’t seem to pass up a tart, tangy zippy lemon dessert. 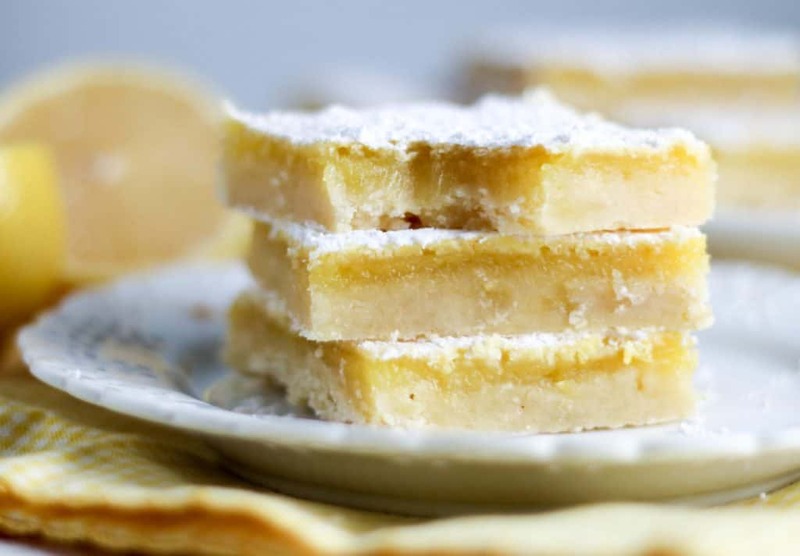 Like these easy lemon squares. 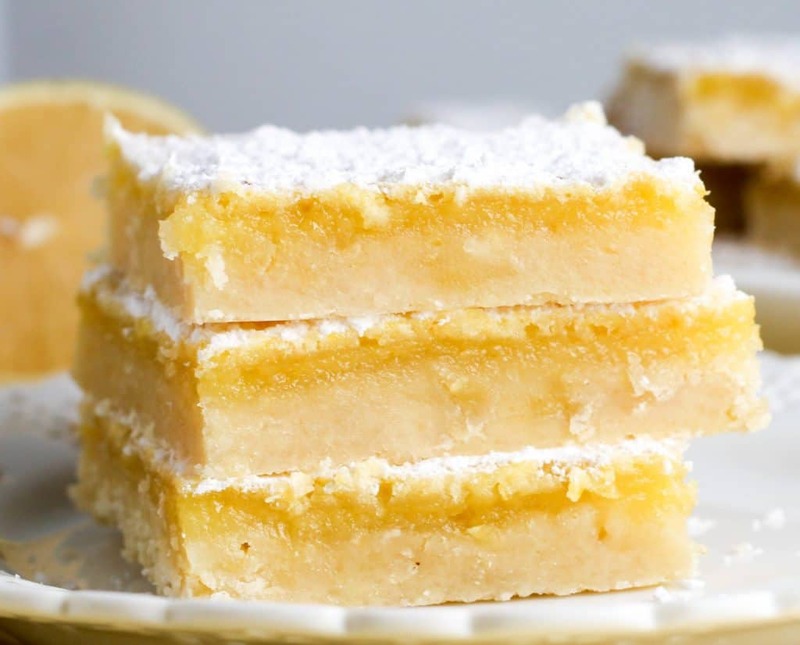 Lemon squares. Lemon bars? Oh who cares, they are so good. So let’s not waste any more time and let’s get into it. To make these lemon bars, first start by making the shortbread crust. 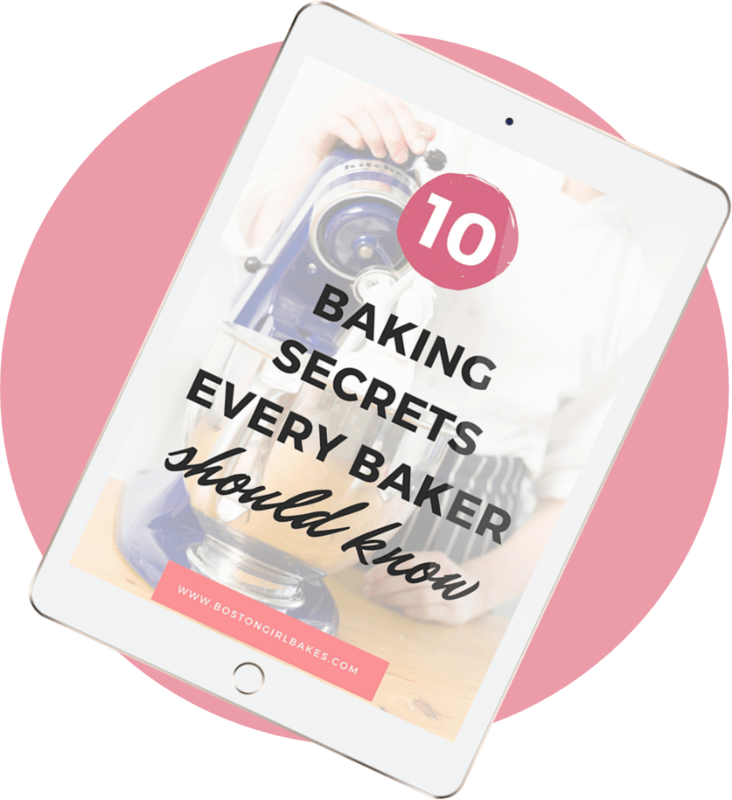 You want to combine in your metal mixing bowl, your correctly measured flour, granulated white sugar, and softened butter. If you forgot to take your butter out ahead of time, then here are 3 ways to soften your butter. I used my pastry blender to work the butter into the flour and sugar. You could also just use your hands. Don’t be afraid. Get in there. Then go ahead and press the mixture into a greased 9×13 pan. 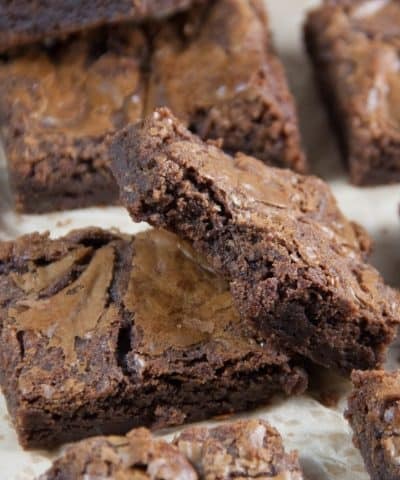 I made one batch in a 8×11 pan, which you can do if you want a thicker bar. I preferred the 9×13. But hey, you want thick. Go thick. You want thinner. Go 9×13. You’re the boss in your own kitchen. Pro Tip: Use the bottom of your dry measuring cup to press the mixture into your pan. Now while these bake for about 20 minutes, go ahead and use the SAME bowl to make the lemon part. Ok let’s not get sidetracked. I could talk cookbooks all day. But today we’re talking lemon bars. In the same bowl, you need to add some white sugar, flour, 4 room temperature eggs, and of course your lemon juice. Now here is what I don’t like about most lemon bar recipes out there. They say vague things like “juice of 3 lemons”. Um, I don’t know about you but I don’t always get the same amount of juice from my lemons every time. So frustrating. 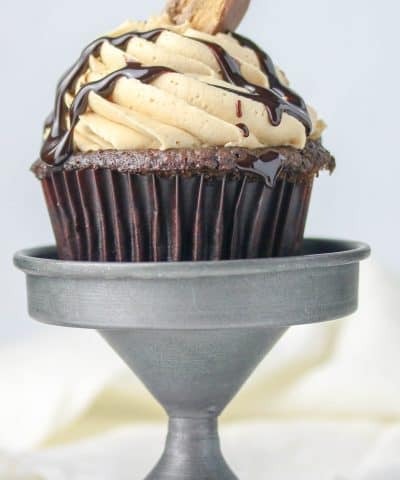 So when I tested this recipe I used a glass measuring cup to make sure that I give you an exact amount. I wanted mine nice and tangy so I used 2/3 cup of fresh lemon juice. Which, was usually about 3 lemons (sometimes 2 1/2, sometimes 4). See what I mean? Not always the same. I also threw in some lemon zest for a real lemon punch. If you want a less tangy lemon bar, you can leave out the zest. Not me. And that’s it. 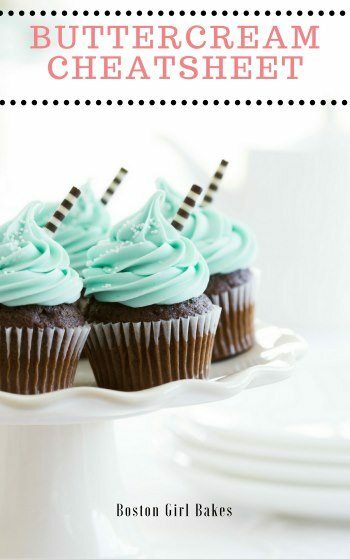 Give it a whisk (have I told you about my new favorite kitchen tool, this whisk?). And you’re all set. Once your crust has baked, time to pour the lemon filling over it. Be sure to pour the lemon mixture over your crust while it’s still hot. And then bake for another 20 minutes. That’s it! Oh wait. 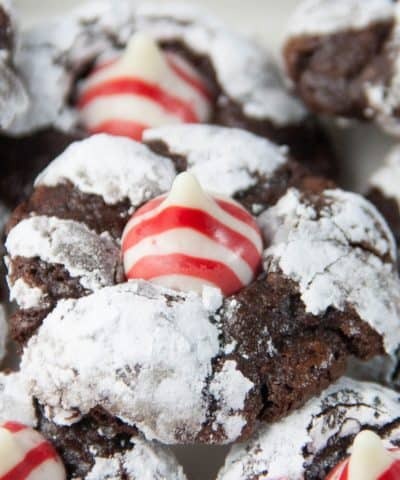 You need some powdered sugar on top of course. I used a sifter to sprinkle some powdered sugar right on top. Be sure to do this while the bars are warm, so the sugar sticks. And here comes the hard part. Letting the bars rest and set up in the fridge for about 2 hours. I told you it was the hard part. But then it’s time to cut, eat, enjoy, repeat. Make sure to measure your lemon juice. Not every lemon gives the same amount of juice. To be on the safe side I’d buy 4 at the store. Sometimes it only takes 3 but I like having an extra just in case. 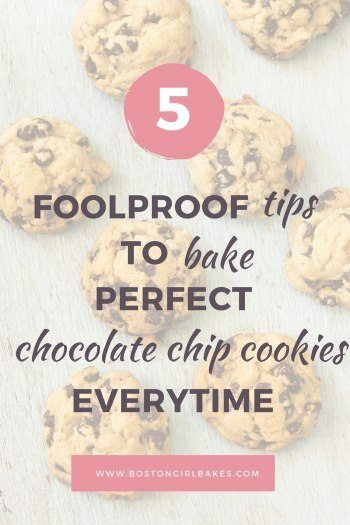 Make sure to measure your flour accurately by scooping with a spoon and leveling with a knife. For a complete tutorial, read this post. You need to make sure you are using softened butter for the shortbread crust so it’s incorporated easily.. Here are 3 ways to soften your butter quickly. When the crust is done, you want to pour the filling over it immediately. This kind of makes like one beautiful crust to lemon layer. Dust the bars with powdered sugar when the bars are warm so the sugar sticks. I like to dust them twice. The first time the sugar sort of melts in, and the second time creates a beautiful layer of powdered sugar on top. Learn how to make these easy lemon squares in the video below! How Do You Cut Lemon Bars? You can use a sharp knife that is cleaned off after each cut or dipped in warm water to make a clean cut. I also like cutting bars with a plastic knife. I find I get a cleaner cut this way. Again it’s best to clean the knife off after each cut. 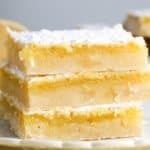 Should I Refrigerate Lemon Bars? Yes you should! Because they are technically a custard, they should be kept in the refrigerator unless you are serving them right away. 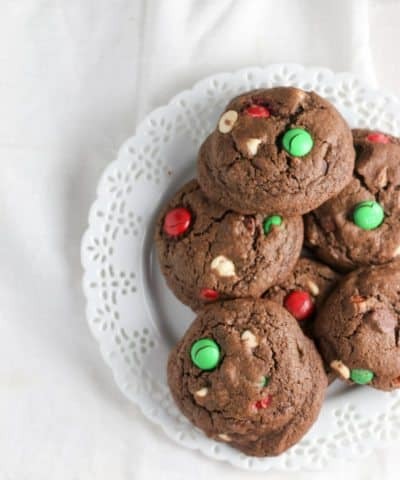 They can stay out for a few hours at room temperature if you are serving them at a party, though. After that however, store them covered in the fridge! How Long Do Lemon Bars Last? These will last about 4 days in the refrigerator. Just be sure to keep them well covered. If they last you that long that is! I seriously love one bowl desserts. They might be my new favorite thing. Like this S’mores Chocolate cake, or this apple sheet cake. Or my favorite…this peach rasbperry tart. Now I don’t know who “they” is that says my tastebuds have changed as I have gotten older. Maybe I just didn’t get to have the best lemon bars in the world as a kid. Because if I did, I know I wouldn’t have passed them up. 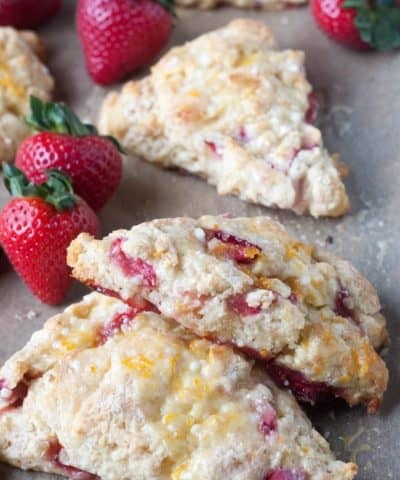 If you like this recipe, be sure to leave me a comment and leave a star rating below! Easy Lemon Bars with a shortbread crust that can be made in one bowl! `Pre-heat oven to 350oF/180oC. Spray a 9x13 baking pan with non-stick cooking spray and set aside. 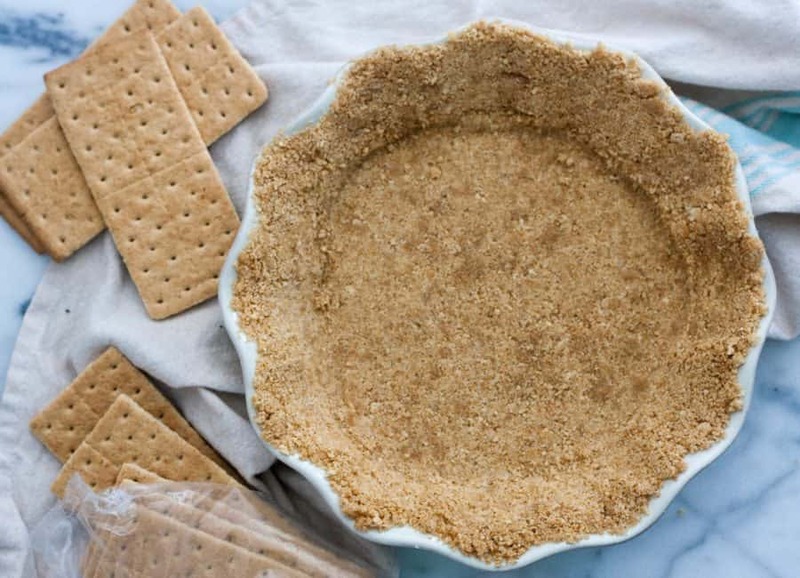 Make the shortbread crust: In a mixing bowl, whisk together the flour and sugar. Then using a pastry blender or your hands, cut the butter into the mixture until it resembles coarse crumbs. Then press into the bottom of the your 9x13 pan. You can use the bottom of a dry measuring cup to press the mixture into the pan or just use your fingertips. Bake the crust for about 20 minutes. Meanwhile, while the crust is baking prepare the filling. In the same bowl, whisk together all the filling ingredients. When the crust is done, remove from the oven. Immediately pour the lemon filling over the hot crust. Then return to the oven again for another 20 minutes or until the filling is set. 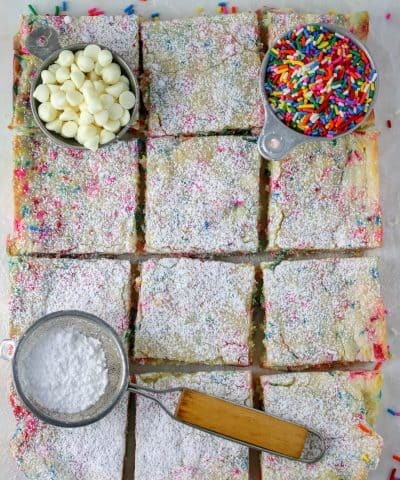 Immediately dust the top of the lemon bars with powdered sugar. Allow the bars to cool completely and set up in your refrigerator (usually about 2 hours). Then cut into bars and serve. Make sure to measure your lemon juice. Not every lemon gives the same amount of juice. To be on the safe side I'd buy 4 at the store. Sometimes it only takes 3 but I like having an extra just in case. You need to make sure you are using softened butter for the shortbread crust so it's incorporated easily.. Here are 3 ways to soften your butter quickly. If you want thicker bars, use a smaller pan - 8x11 pan. You will need to bake the crust and filling for a few extra minutes. If you want less zesty of a bar, omit the lemon zest.